In small bowl or measuring cup, mix marinade ingredients. In large resealable food-storage plastic bag, place chicken thighs. In another large resealable food-storage plastic bag, place potatoes, zucchini, bell pepper and onion. Pour half of the marinade over contents in each bag. Seal bags; turn to coat contents with marinade. Refrigerate at least 30 minutes but no longer than 6 hours, turning bags occasionally. Heat oven to 400°F. Line 15x10x1-inch pan with foil. Place chicken thighs, skin side up, on one side of pan and vegetables on other side of pan. Pour any remaining marinade over chicken and vegetables. 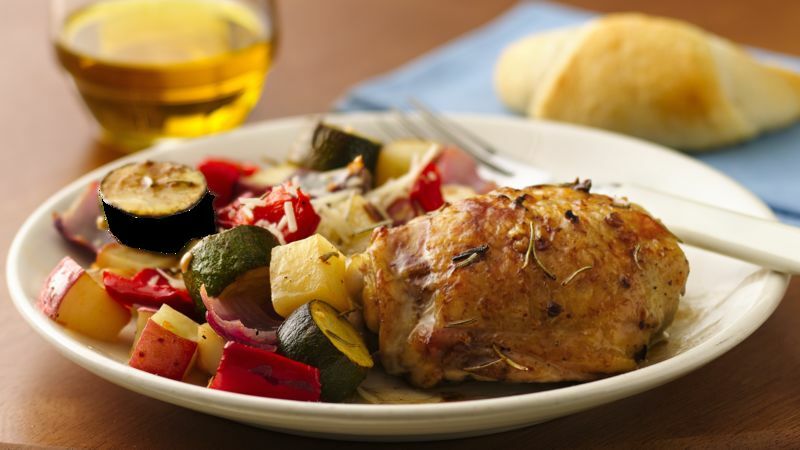 Bake 35 to 45 minutes or until vegetables are tender and juice of chicken is clear when thickest part is cut to bone (180°F), spooning juice in pan over chicken and vegetables halfway through bake time. Sprinkle with shredded Parmesan cheese if desired. For variation, try sprinkling chicken and vegetables with crumbled feta cheese. The most economical way to purchase feta is in chunk form versus crumbled. Rosemary is an herb that is readily available fresh in most grocery stores. The flavor hints both of lemon and pine. To use fresh in place of dried, use twice as much fresh as dried. Since rosemary leaves are stick-like, crumble them just before they are used.